The meme of scary, radical Islam is popular on Fox “News” which used the “controversy” surrounding the proposed Islamic center in NY City as a way to play the fear of radical Islam card. The solons in Fox management would say that they’re only reporting on extremist and not mainstream Muslims. However, the constant drumbeat of the Islam bashing narrative of creeping Sharia by Islamophobic Fox guests such as Frank Gaffney, Debra Burlingame, and Pam Geller, reinforces what appears to be the promotion of bigotry which, as seen in a recent spate of apparent hate crimes towards Muslims, doesn’t distinguish between radical and mainstream Muslims. But rather than examine their own lack of fairness and balance, as it relates to issues about Islam, Fox “News” is now attacking the mainstream media for not being tough enough on "radical" Islam. This morning, right wing media critic Brent Bozell attacked ABC’s Christiane Amanpour’s recent “town hall” discussion about fear of Islam. And last night, Bill O’Reilly did the same thing, albeit with a different perspective and with neo-con Charles Krauthammer to back him up. Now if that ain’t “fair & balanced,” I don’t what is! What wasn’t fair & balanced was how Bill, in his focus on radical Islam, neglected to report on radical Christian Franklin Graham’s commentary during Amanpour’s discussion. Can’t let the folks see the “American Taliban” in action when you can get so much more mileage out of scary Islam. But as a propaganda two-fer (librul media and radical Islam) it was classic. The title of the Fox video “Islamic Flag Over the White House?” says it all. Are ya scared yet? Bill’s beginning backdrop was a photo of a Muslim with the caption “radical rhetoric.” Bill didn’t play the part of the video where Franklin Graham made some stupid (but typical) Islamophobic comments – but he did play Amanpour’s question about whether there was agreement with Graham’s comment about how we should fear Islam. The video showed a response, from an Islamic cleric in London, that the “east and west will be governed by Sharia” and “the flag of Islam will fly over the White House." Bill said “wow” and told his guest, Charles Krauthammer, “If I were Christiane Amanpour” (at which point he laughed and said “what a thought”) “I would have laughed and called him a loon.” (Would he have laughed at Grahams’s comment that Muslims want to build as many mosques as they can, in America, to convert Americans or Robert Spencer’s lie that Imam Rauf advocates Sharia?) Krauthammer then spoke about how radical Islamists in Europe want to impose Sharia. (Are ya scared yet!) O’Reilly said that Amanpour should have challenged the statement. Bill didn’t seem to understand that Amanpour was moderating a discussion among a number of people; and as such, it wasn’t her role to reprimand the panelists. After the cleric’s comment, Donna Marsh O’Connor, whose pregnant daughter was killed on 9-11, remarked that the cleric’s statement was no different from Graham’s comment about how Christianity is the only true religion. Bill continued to blither about what should have been said to the cleric and used it as an excuse to bash ABC: “That’s what gets me about ABC, I’m not picking on them because they have really good people…but CBS and NBC never, ever really get into it. The let this stuff go and I don’t think they should.” (Not to worry, Fox “News” doesn’t!) Krauthammer played the be scared of Islam card when he said that “if there ever is an invasion, it will be by force.” (Excuse me – this is a comment by one radical cleric. Why are we talking “invasion?) He added the requisite neo-con talking point about how “that’s what the acquisition of nuclear weapons by Iran is all about.” He continued to blither about European Islamic communities that are off limits to police and how the Europeans are “supine” but Americans, because Muslims are assimilated here, are not vulnerable to internal attack. Comment: The Amanpour discussion was an effort to deal with fear of Islam – something that conservative Fox, as shown by this discussion, seems to promote. Unknown to Bill’s audience was the fact that the “radical cleric” represented only a small part of the discussion in which moderate Muslims, such as Reza Aslan, participated. Charles Krauthammer’s barely disguised bigotry towards Islam is certainly not an example of a “bedrock of decency.” The radical London cleric is not your typical Muslim. But O’Reilly and Krauthammer represent a segment of America for whom bigotry and fear are “family values.” That they see Fox News as a way to promote that bigotry is really scary. Note - full transcript of discussion is here. 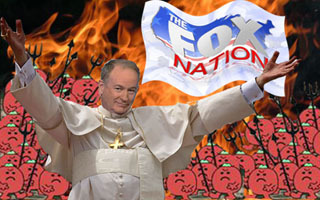 Oh and about that anti-Christian bigotry being "the last acceptable prejudice" - not on Fox, nosirree!!!!! !